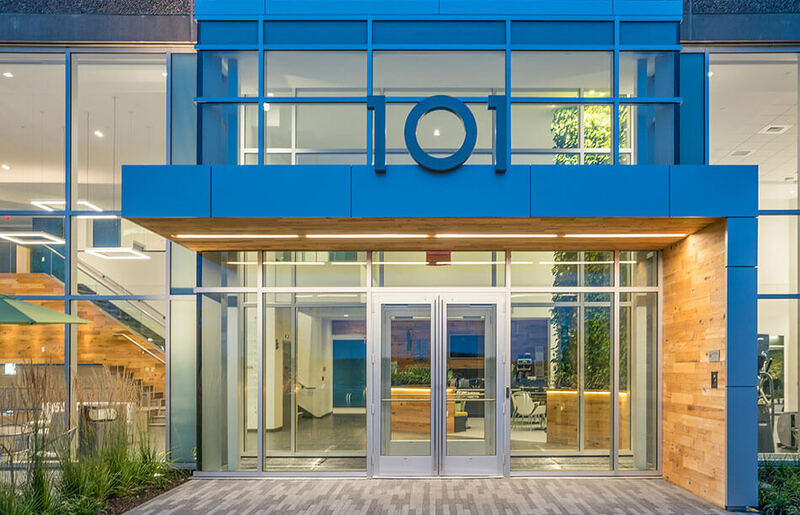 Margulies Perruzzi Architects refreshes Station 101 using biophilic design to attract and retain happy tenants for their client resulting in well-being for everyone. 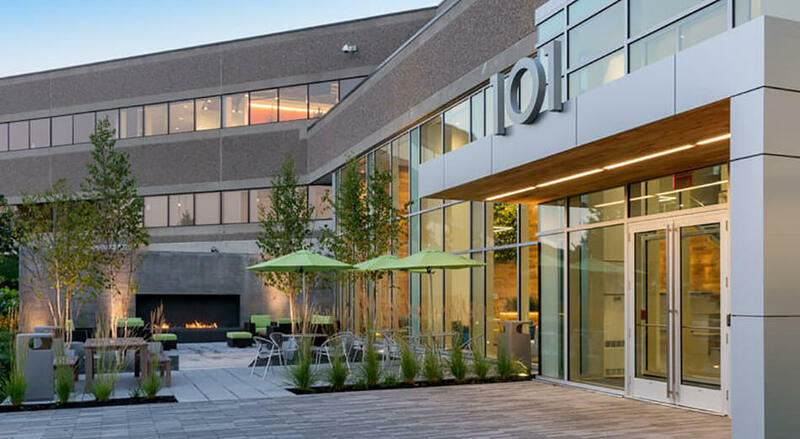 When National Development commissioned Margulies Perruzzi Architects (MPA) to repurpose the building located at Station 101 Drive in Westwood, MA, their goal was to attract and retain tenants to the existing multi-tenant office building. MPA met this business challenge by focusing on occupant well-being. 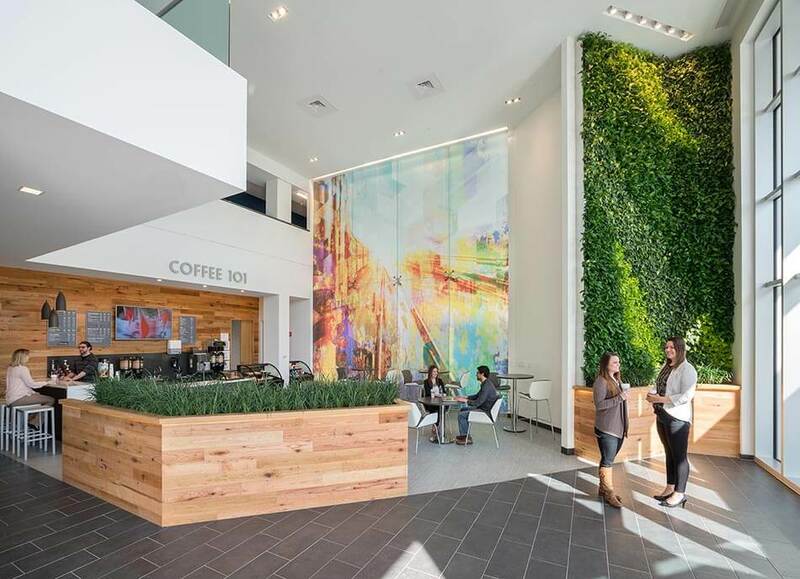 The communal meeting, workspace, and café in the lobby of the building is one area where their biophilic design efforts are apparent to everyone who enters the building. As you approach the entrance of the building, you’ll find an outdoor seating area that appears to flow indoors separated only by a high wall of glass. The glass wall allows interior occupants an abundance of natural daylight, great sky views and the illusion of merging with the outdoors. A variety of casual indoor seating options are available from table & chairs, cushions, and couches to stadium seating, all bathed in natural light with clear views of the outside. MPA incorporated natural elements throughout. There are two living walls and many planter boxes packed with greenery all nicely situated for sharing their feel-good effect. Studies show that creative thinking is enhanced and moods are elevated by the presence of leafy green plants. TerraMai’s reclaimed Mission Oak paneling warms the space bringing natural wood packed with character and texture. Just like plants, wood has been shown to inspire creative thinking while providing an uplifting yet comforting sensibility. The ultra-high ceilings provide spaciousness and inspire conversation and creativity. Add the aroma of coffee and good food and the space has all the elements for happy occupants. 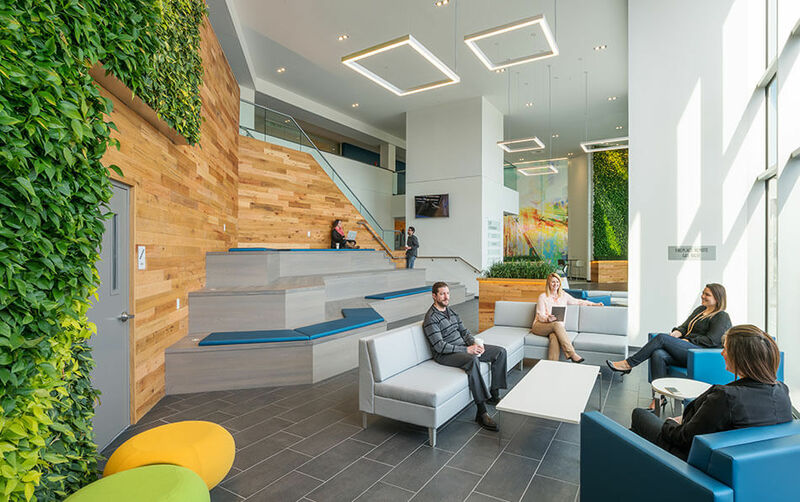 These biophilic features are the design foundation that set the stage for people to engage and connect. Quantity and quality of social engagement, and being exposed to nature and natural elements, are key components of well-being. Beyond the lobby, the redesign incorporated fitness options for the various likes and needs of occupants. The large fitness center is well equipped but importantly is given a prime location that, like the lobby, has high ceilings and a full wall of glass providing motivational natural light and expansive exterior views. For those who want to get outdoors, the surrounding grounds are beautifully landscaped with walking paths, and bicycles are provided. Internally, open stairwells and office layout are planned to encourage people to get up and move around. Regular exercise has a profound impact on well-being by relieving stress and improving sleep, memory and overall mood. Station 101 has design elements to positively enhance an occupant's state of mind. Employee well-being and organizational outcomes are intertwined. 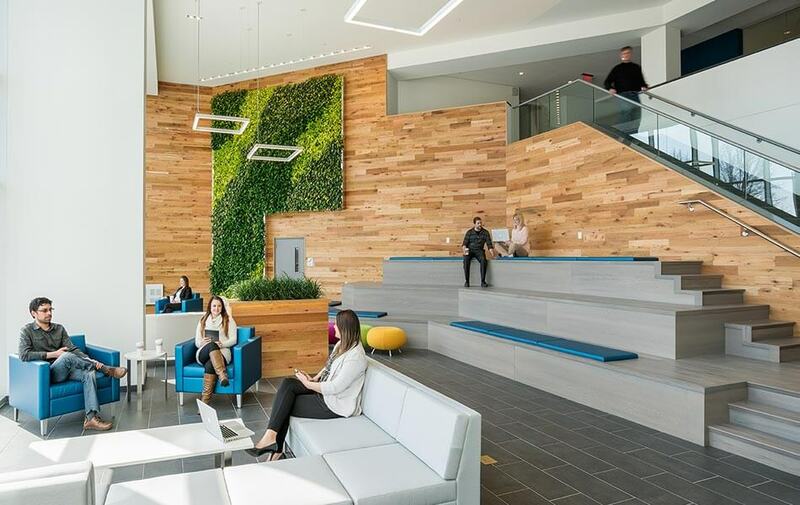 Since MPA’s redesign, the space has attracted and retained tenants while also elevating the market value of the building. Happy client, Happy occupants. Well done MPA. Mission Oak celebrates its prior life as railroad shipping dunnage displaying checking and nail and other fastener holes to give an overall soulful aesthetic. As shipping dunnage, this hard-working oak was used to load, secure and protect cargo and has traveled across the country many times over.